SHEPWAY District Council has admitted to polluting a canal with hydraulic oil, endangering wildlife. It was the oil from its own workboat that polluted the 28 miles long Hythe Canal a week ago and is spreading, yet work has only just started in its clean-up, Alan tilbury reports. “The birds are in a pretty bad state, they were not going into the water because the oil makes them sink and become cold. As they’re not using the water they become susceptible to other predators. The long and short of it is they are at risk of death without intervention. 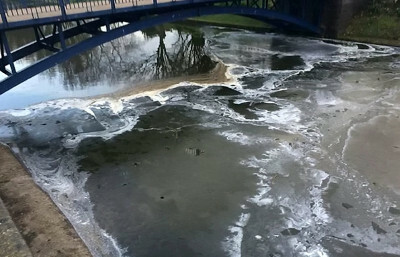 It was on the 5th March when the canal was polluted, with many complaints of inaction by the council, with a councillor for Hythe Town Council calling for a prosecution. The cause of the pollution was a hose that spit on the workboat allowing hydraulic oil to be pumped into the waterway, with the council stating that it will now renew the hose every three years to prevent further pollution.